The June highlight for me was attending the Third Annual POPCAANZ Conference in Melbourne (27th-29th June) where I presented a paper on my latest obsession, lamingtons, and had the pleasure of mixing with other food people and hearing about their research. Carmel Cedro from Monash University who presented a paper on the Dolly Varden cake tracing its evolution from the first recipes of the 1880s to a modern incarnation as an Amy Varden cake, dedicated to the late Amy Winehouse. Toni Risson, who some of you may already know from her book Aphrodite and the Mixed Grill which has just be reprinted, talking about children's birthday cakes and in particular The Australian Women's Weekly Children's Birthday Cake Book. With my interest in cake this paper set me thinking about how we have transferred the time and energy and emotional commitment which might once have gone into the making of the cake to the decoration of the end result of adding egg to a packet cake mix. Donna Lee Brien from Central Queensland University whom I met last year at the Gastronomy Symposium in Canberra, introduced us to Maria Kozslik Donovan. 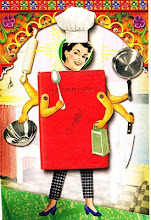 Mrs Donovan was a cookery writer who began her career in Melbourne in the 1950s writing in The Age and published several books including The Blue Danube Cookbook, Astrology in the Kitchen and Continental Cookery in Australia. She had a fascinating life and her writing certainly puts a new perspective on the idea that Australia was a gastronomic desert in the 50s and 60s. Jill Adams, who is working on her PhD with Donna Brien at CQU, spoke about Mrs Dione Lucas. I wrote briefly about Dione here. Jill has not only found out more about Dione Lucas and her visits to Australia but has also met her eldest son and learnt a lot more about the real Dione. There were also two papers about wine, one from Felicity Ameron on the role of Mary Penfold in the establishment of the Penfold winery and one from Lloyd Carpenter on the use of nostalgia to market wines from the Central Otago area. New Zealanders were well represented with Lindsay Neill, from Auckland, talking about kiwiana (that is the NZ equivalent of Australiana) and in particular the White Lady pie cart (which is a fixture in Auckland, imbued with all sorts of cultural and societal importance and is a significant tourist attraction), Lorna Piatti-Farnell talking about food in Katherine Mansfield's fiction and Rowan Holt arguing that the home economics teacher is a better role model for young people than the celebrity TV chef. Tania Splawa-Neyman from RMIT (School of Arichitecture and Design) gave a terrific presentation entitled 'Food and fashion on the web: the cultivation of culture' which explored connections between food and fashion, asking questions such as - Does food design fashion, or does fashion design food? What does this linkage say about our culture? Is society predominantly concerned with the basic need to be clothed and fed? Or is popular culture shaped by how we wish to be seen while clothing and feeding ourselves? In particular the images Tania showed generated some lively discussion. Have a look at wardrobevpantry here. I particularly like this one, this one and for something to really make you think, this one. Unfortunately there were two papers I missed altogether - Michelle Phillipov (lecturer in journalism, media and communications at the University of Tasmania) talking on the way Master Chef offers insight into debates about food and health and the limitations of current public health strategies, and Charmaine O'Brien whose paper examined 'how we might take some lessons from the eating habits, and culinary etiquette, of our aristocratic ancestors to learn how to take an approach to food that is more restrained and that might assist us to reduce our collective waistlines and develop a more respectful sustainable relationship to food'. POPCAANZ produce a journal The Australasian Journal of Popular Culture the most recent edition of which includes articles by Toni Risson, Carmel Cedro, Lorna Piatti-Farnell and Lindsay Neill as per the above as well as papers on The Bushells tea advertising1998-2006 (Susie Khamis), the early days of coffee culture in Australia (Jill Adams) and royal wedding cakes (Adele Wessell). You can find out more about the association and the journal here. I chose this month's illustration because it seemed to fit in with a general theme of cake and afternoon tea and perhaps even lunch. 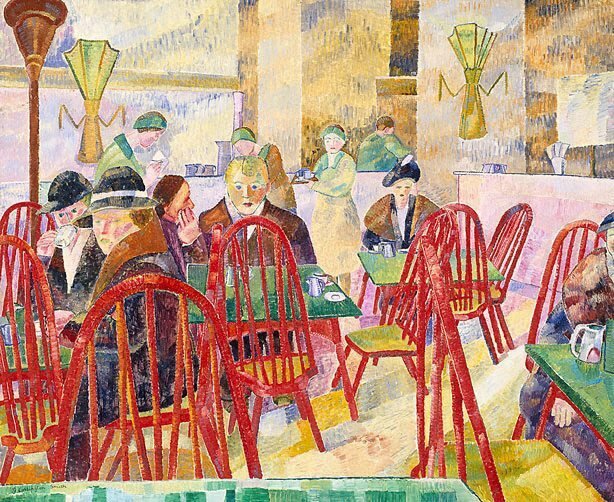 So first up here is a link to an article about a new exhibition at New York Public Library (why wasn't this on earlier in the year) which is all about Lunch. And here is another from Nicola at Edible Geography which fits in with all the talk above about cake and icing. With Dione Lucas and Maria Kozslik Donovan in mind you might also be interested in this article about another forgotten woman and her recipe book. How interestin'! We would have loved to have seen Tania's presentation!